Six workers holding papers with approval check marks. – The training opportunity has a fee, which the registrant expects her employer to pay. If so, a manager needs to approve the request. – The opportunity is external and therefore is not automatically sanctioned by the employer. It needs management’s blessing. 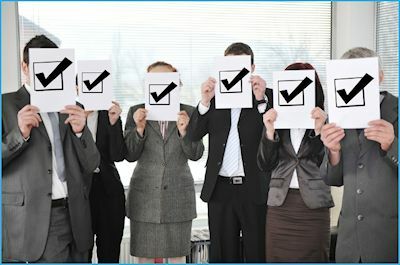 – Management wants to ensure, before allowing the employee to attend, that a training is appropriate to his job level. – Any time taken away from an employee’s primary tasks, even when it is training, needs to be approved by her supervisor. Such scenarios and others like them can be handled through registration approval in a full-blown registration management system. When the approval process function is enabled, a registrant has a pending approval status after submitting the form. First, though, the registrant would choose their supervisor/approver from a dropdown list. Or, all requests for approval would go to one designated approver, such as the administrator for the registration process. Both the approver and the registrant receive communications along the way. The registrant first receives a customized pending approval email. The approver, such as a supervisor, receives an email with all the essential information. That includes who is making the request and a full description of the training opportunity. Based on the information provided, the supervisor can click a link in the message to approve or decline the registrant’s request. The registrant then receives a follow-up email either approving or cancelling the request. With approval, the registrant has a confirmed status for the training. Registration approval functionality keeps employees and others from trying to attend something they shouldn’t, or possibly putting an employer on the hook for a costly training. To learn more about registration approval or to share your registration process challenges, please contact Learning Stream when the time is right for you.